I did a National Day theme for my boy's lunch today. The message I wish to convey was there are four major races in Singapore; Chinese, Malay, Indian and Eurasia. I mixed a little soya sauce into the onigiri (rice balls) and added the facial details with nori. And a touch of ketchup on each of their cheeks. Would you be able to distinguish the races? 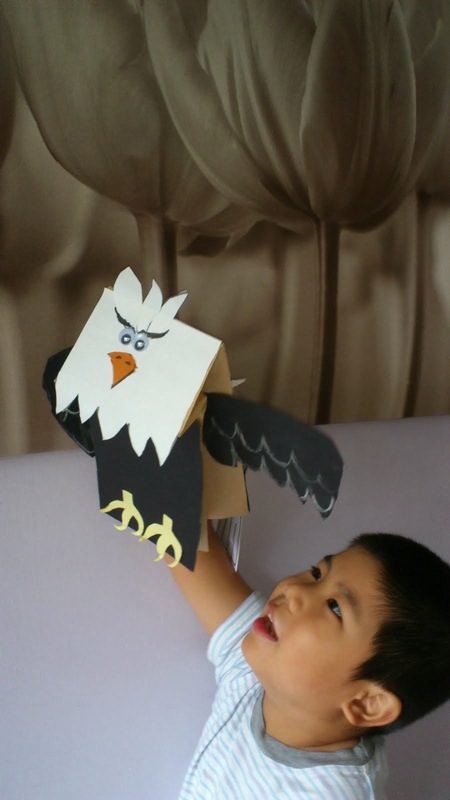 My son commented they looked "funny" though :P In his box, he got stir-fried chicken thigh with ginger/soya sauce, fried egg with French beans (not visible because it was hidden underneath the onigiri), Japanese cucumbers, red grapes and an apple wedge that I carved our Singapore flag. The other bento was prepared last Friday. 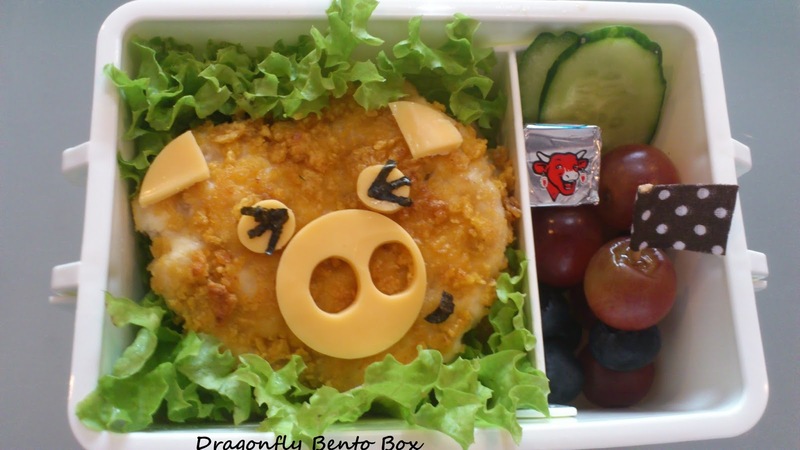 Cheek piggy was made of chicken breast patty coated with crushed corn flakes. 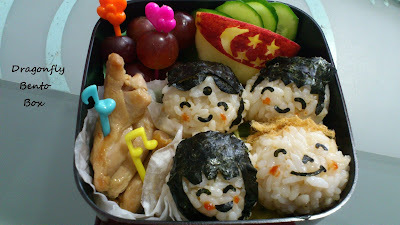 Nori and cheddar cheese were use for the facial details. There were two pieces of patties which I sandwiched with Japanese cucumbers and tomatoes. On the sides, he had slices of cucumbers, red grapes and a cube of laughing cow brand cheese. We again spent our weekends without Papa who flew to Malaysia to attend family matters. 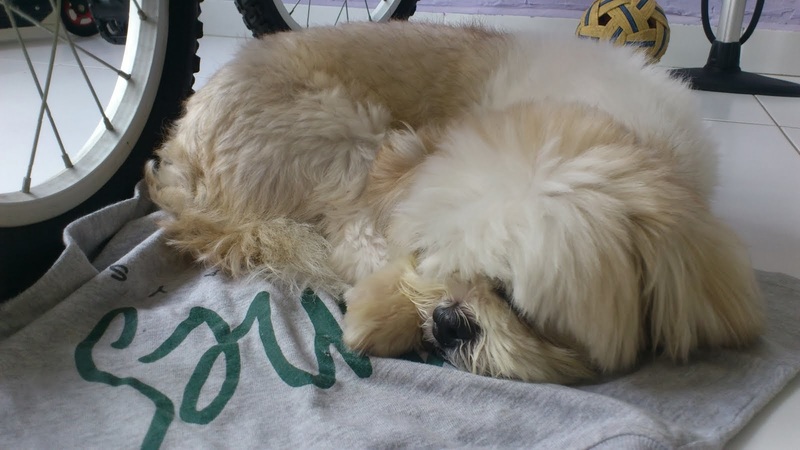 We were used to Papa's frequent travelling schedule (due to his nature of work and lately, for family matters). My boy even more happy because he could 'sleep with Mommy'. For the records, he does not sleep with us as he has his own room. 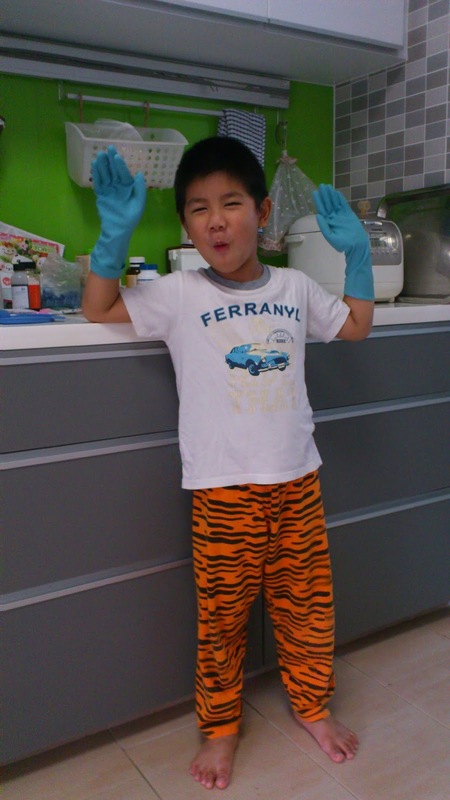 At the age 5 years old and 4 months, I would not expect him to help in household chores. Other than, clean up his own mess after a meal and tidy up his own bed when he wakes up. 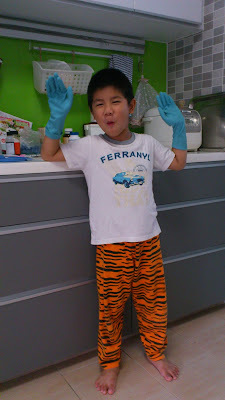 But last Sunday, he was so sweet that he volunteered to help me to wash the toilet and wipe the main door. He was serious in the job although it was far from perfect. I rewarded him with two gold coins for his effort ($2). To all my readers, Happy holidays!! And of course, Happy 48th Birthday Singapore!!! Great job! I love the National Day theme bento! You mean you could carve those stars out from an apple? Amazing!! Thanks for linking up! Thanks! Yes, I carved those starts out from the apple.